The Celestron SkyPortal WiFi adapter is temporarily sold out. 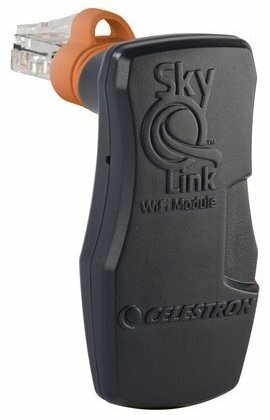 With the Celestron SkyQ Link 2 Wifi adapter you can control your telescope using your smartphone, tablet or computer. Thanks to the free SkyPortal app, you can control your telescope with your mobile device. This Wifi adapter is suitable for GoTo telescopes. With the Celestron SkyQ Link 2 Wifi adapter you can easily control your Celestron telescope using your smartphone, tablet or even PC. This adapter is suitable for GoTo telescopes from Celestron. The adapter is easy to connect to the telescope. You can then download Celestron's free SkyPortal app to connect your mobile device to the adapter. When everything is ready, you can align your telescope to two or three bright stars. You can then control the telescope via the Celestron SkyPortal app. The app also contains spoken texts (in English) that tell everything about the objects that you can observe. Write a review By sharing your experience with the Celestron SkyPortal WiFi adapter, you can help others (perhaps still doubting customers) with making a good choice.